David Bowie reciting The Lord’s Prayer, Wembley Stadium, 1992. There’s been so much written about David Bowie in the week and a bit since he died, but this piece about him doing the Lord’s Prayer at the Freddie Mercury tribute concert at London’s Wembley Stadium in 1992 is my favourite. For decades it’s been easier for African American stars to swing between the secular and the spiritual – maybe in part because so many of them grew up singing in church – but it’s rare territory for an English rock legend. Though that’s precisely what Bowie did on April 20th, 1992. My own tribute article to David Bowie (published on Monday – click here to read it) tried to analyse what it was that made him so ever-increasingly cool. Only I’d neglected to mention this moment from the Freddie Mercury concert, purely because I’d somehow forgotten all about it. But David Bowie? In the hands of someone so intelligent, so worldly-wise and so damn cool, The Lord’s Prayer was stripped of all artifice. It was sincere. It also raised some questions, namely, what was it that compelled Bowie to recite it? Did he believe in God himself? Was he religious? All of which is answered in this article – click here – as published by pjmedia.com. Including the fact Bowie only decided to do the prayer five minutes before taking to the stage. Enjoy the read. And if you haven’t seen it, here’s David Bowie performing alongside Queen and his longtime guitarist Mick Ronson on Heroes. 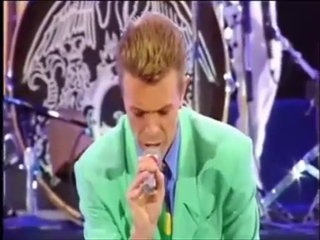 As the song concludes, Bowie talks of the scourge of AIDS before dropping to his knees. Thanks so much for sharing this Tim!! I was listening to you and TW last night and heard you mention David Bowie's Lords Prayer recital. It is very moving and just incredible how it silenced such a huge crowd of people. I enjoy listening to your radio show, some very interesting subjects and laughs.